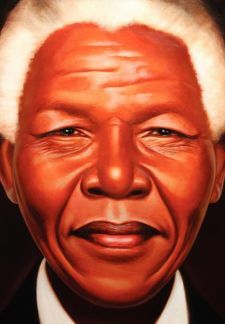 A vividly and beautifully illustrated book for young children on the life of Nelson Mandela. Unfortunately, the high quality of the illustrations is not matched by the accompanying text. The text raises two concerns: what is emphasized and what is left out. There is nothing in Mandela’s autobiography to suggest that he believed that his initial meeting of Winnie was at the intervention of the ancestors. I want to make it clear, that I am in no way belittling or de-emphasizing the importance of ancestors within the cultures of South Africa. However, in a children’s book where there is no room for explaining concepts that are unfamiliar to the young readers, I fear that the manner in which the author uses the term will at best confuse the readers, or at worst, reinforce exoticized perceptions of African cultures and societies. In his presentation of Apartheid policies and practices, the author privileges social segregation — European only beaches, parks, theaters, etc.– what has been termed petite Apartheid. This is fine given the intended audience, but it is incredible that the author does not mention the core of grand Apartheid, political exclusion, severe economic exploitation, and egregious social discrimination in areas of education, healthcare and housing that were at the center of the ANC’s and Mandela’s opposition to Apartheid. In spite to these weaknesses, I still recommend this book. While incomplete, it is a good tribute to one of the truly great human beings of the past century.